A woman was left trapped when her car flipped onto its side in a crash in Ilkeston. 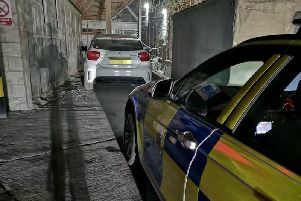 Firefighters were called to Little Hallam Lane at aroind 1.19am this morning (Ferbuary 18) after reports of the collision. A service spokesman said the incident involved a collision where the vehicle was on its side - leaving a woman trapped inside. The vehicle was stabilised and one female casualty was removed from the vehicle by the service. The ambulance and police were also in attendance.